Episode 1: Enter: Naruto Uzamaki! Episode 1: Enter: Naruto Uzamaki! Last I checked, this character's cosplay outfit was available at Milanoo and Xfancy. The above info came from Florence, and was edited by yours truly (contact me). The image came from screen. Shikamaru Nara is in Team #10, which is Asuma Sarutobi's team, along with Ino Yamanaka and Choji Akimichi. Nara can use shadow Jutsu with a limit of about five minutes. He's a good team leader and really intelligent, but everything is annoying to him! 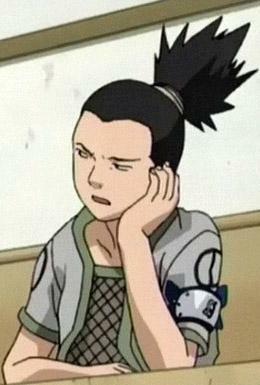 Shikamaru Nara is a lazy genius. He finds many things in life to be annoying or troublesome and is usually foul mouthed. But, deep down, he is a kind person. Not only is he kind, but he is a genius with an IQ of 200+. He is a brilliant strategist as well as a level-headed thinker. He also enjoys the game "Shougi", which is basically like chess. Though he lacks motivation, this allows him to think clearly without becoming overly excited. These qualities were recognized by others for they could see he was a great leader, worthy of becoming a chunin. That is why he was the only one of Naruto's class mates to become a chunin on his first try. Apparently, Nara also likes to look at clouds. When he was remembering how he and Chouji met, and how they became friends, he told Chouji that the seat was reserved for him, and that he would get lazy and just sit back and watch the clouds. Some fans feel that Shikamaru may have a slight crush on Temari, and point to potential evidence in a few places. 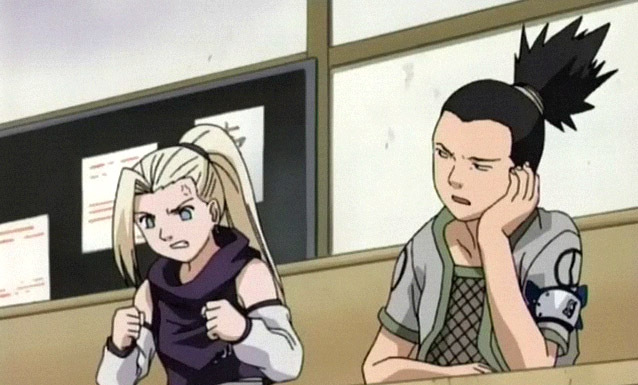 In episode 135, when Shikamaru is sitting and talking to Temari outside of the ICU, it seems that he cares about her opinion. Also in episode 125, Shikamaru smiles when he says "She's scarier than my mom." And then the sunlight shines on Temari's face, stating that Shikamaru thinks that she is pretty. Others say this in complete nonsense. The above description came from Florence and Toriko Takeshi, and was edited by yours truly (contact me).